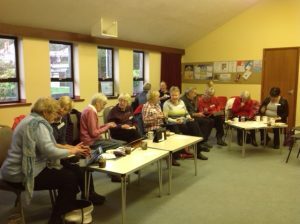 The first iPadders group was launched in March 2013 in response to a conversation between a few U3A members interested in exploring the intricacies of their newly purchased Apple iPad tablet computers, in an endeavour to keep up with their grandchildren! 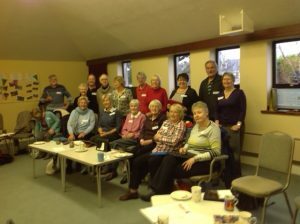 Since then we have gone from strength to strength and now boast 4 groups, meeting in people’s homes on a monthly basis (on Monday mornings, Monday afternoons, Wednesday and Friday mornings). Our meetings all run on an informal basis, with no fixed agenda, but the 1 ½ hour sessions pass very quickly, with coffee and cake (some groups) or biscuits (for those watching their waist-lines). We find the optimum working number for a group is about 8, and sometimes have a short waiting list, although currently there are spaces in two of the groups. We abide by the U3A ethos of sharing knowledge and expertise by learning from other members in a relaxed and friendly environment. We have fun sharing any new aspects of our iPads which we have discovered, take satisfaction from solving members’ problems and queries, and try and keep abreast of any new updates and improvements which Apple are constantly introducing. We all wonder how we managed in our pre-iPad days – anyone reading this who may be considering the merits of purchasing one would receive an enthusiastic response from any iPadder. A classic quote from one of our members says it all: “we don’t need the iPad Tips and Tricks App as we have each other”. (Ask an iPadder for an explanation! ).